The BBC's security correspondent Gordon Corera gains exclusive access to the ultra-secret Government Communication Headquarters at Cheltenham. The BBC's Security Correspondent Gordon Corera gains unprecedented access to Britain's ultra secret listening station where super computers monitor the world's communications traffic and Britain's global eavesdropping and electronic surveillance operations are conducted. The layers of secrecy which have surrounded GCHQ's work are peeled away - what exactly does it do and who is it listening to? The programme explores the wide area covered by signals intelligence - from looking for terrorists planning attacks against the United Kingdom to supporting military operations of the type underway in Afghanistan. A team from the Counter terrorism section describes what it is like to listen in on terrorists' conversations and the constant battle to predict where the next attack will come from: "I don't think you would be human if you didn't go home at night and couldn't switch off and thought 'Oh my God. What happens if . . .?'" What about the ethics of eavesdropping and how does their work compare to the way it is portrayed on television in series like 'Spooks'? Code-breakers talk about their work, attempting to find a chink in the armour of a carefully encrypted message sent by a terrorist or a foreign government. "It just feels amazing really," when there is a breakthrough, says one. "I mean you feel like you've won". The programme looks at the technological challenges posed by the internet and the threat of cyber warfare, which has led to the establishment of a new cyber operations centre at Cheltenham. It also explores the scientific and mathematical breakthroughs which have been achieved at GCHQ, including the discovery of public key encryption, used when we shop on the internet. There's a tour of the building's four great computer halls, containing racks and racks of IT equipment and covering around ten thousand square metres. "I could actually fit Wembley football pitch into three of the halls quite comfortably,' says the man in charge of making sure that the equipment doesn't crash. Gordon Corera challenges the director Iain Lobban. 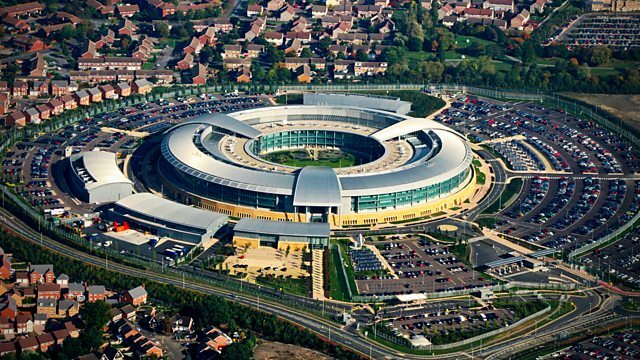 There has been considerable speculation about whether the government is planning huge databases at GCHQ to keep track of all communications and internet traffic. Do they really spy on us? And how accountable are they? Security Correspondent Gordon Corera reveals the story behind Israel's secret service. Phillip Kemp asks if the investigation into MI6 agent Gareth Williams' death was flawed. Delve into the secret worlds of codes, codebreaking and cyber attack.